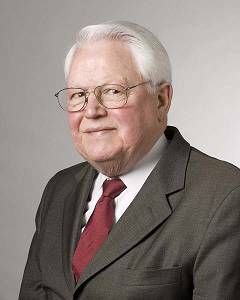 Henry Howson Skillman - Skillman Family Association Inc.
Henry Howson Skillman of West Chester died at the Hospital at University of Pennsylvania on Sunday March 8, 2015 surrounded by his loving family. He was born August 1, 1926 in West Chester to Willis Rowland Skillman and Clara Louise Howson. He attended West Chester public schools, Westtown School and graduated from Phillips Exeter Academy. He served in the Navy in 1945 to 1946 and later in the reserves, achieving the rank of Ensign. He earned his B.S. at Massachusetts Institute of Technology and a J.D. from Temple University. He was admitted to the Pennsylvania Bar. In 1954, he married Josephine Evelyn Kopchany, a nurse originally from Uniontown, Pa.; he was devoted to Jody and she survives him. He practiced patent law first at Howson & Howson, a firm started by his great-grandfather and continued by his grandfather. In 1974 he and his partners founded the firm Dann Dorfman Herrell and Skillman. The firm grew under his leadership. He retired in 2013. Hank worshiped at Calvary Lutheran Church since 1955. He served as its treasurer for 35 years. He served on the Executive Board of the Southeastern Pennsylvania Synod of the Lutheran Church of America and as Secretary of the Board of the Lutheran Retirement Homes in Philadelphia. He served on the advisory board and was the Treasurer of the American Society of Inventors in Philadelphia. The Society provides support for small business and amateur inventors. Hank was their champion. Hank loved his family and was companionable to his friends. He worked to impart his values of hard work and frugality to his children. He enjoyed his house in Mountainhome, Pa. He had a wonderful sense of humor. He was a Republican of the old school who believed that there are men of good will in both parties. He was active in the Theta Delta Chi International Fraternity. Hank’s spirit lives on in his children, David R. Skillman, Henry H. Skillman, Jr., Amy S. Burton, Jan M. Moore and Marc S. Skillman, 10 grandchildren and four great-grandchildren. He is survived by his sister Margaret Woyski. The will be a visitation at 1 p.m. this Saturday, March 14 at Calvary Lutheran Church, 730 South New Street, West Chester. A memorial service will follow. Donations can be made to Calvary Lutheran Church in Hank’s memory.